Would you like to make a unique statement within your commercial or residential living space that would be aesthetically pleasing to any guests or visitors? A made-in-Melbourne Caesarstone kitchen benchtop might be all you need to create a modern, stylish and glamorous look for your workplace or home. Cutting Edge Stone will help you achieve this, being the leading Caesarstone suppliers in Victoria. Not only do we have a wide selection of coloured stone products, but our expert stonemasons have over 40 years of experience. This passion for the art and wealth of experience means we can provide recommendations on which stone materials will be a perfect fit for your living or commercial space. 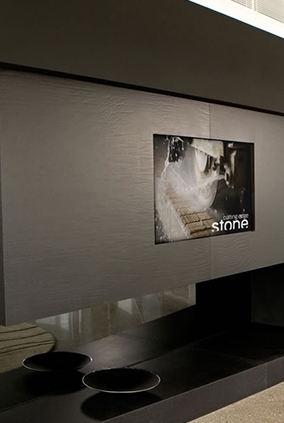 Discover our range of natural options and Caesarstone at our showroom in Melbourne. What makes Caesarstone ideal for the kitchen or bathroom? Any kitchen bench top adds a certain amount of class and style, regardless of what it is used. If you are looking for the ideal benchtop for your bathroom, kitchen or splashbacks, then we would highly recommend you make use of Caesarstone. As a modern alternative to marble, it is very easy to install as well as scratch, stain and heat resistant. Caesarstone surfaces are also perfect for vertical applications such as shower wall panels, and can be used for bath surrounds, inset shelving, vanities, window sills and shower recesses. What is more, the material is mould and mildew free, which makes it ideal for wet areas such as the kitchen or bathroom. Due to our vast experience, Cutting Edge Stone have built up a reputation for being the leading Caesarstone suppliers in Victoria, meaning visiting our showroom will get you one step closer to choosing the perfect Caesarstone benchtop. The team at Cutting Edge Stone care enough to take all the time it requires to gain an understanding of your needs. We pride ourselves in pulling out all the stops to meet deadlines while delivering superior customer services at the same time, providing you with your dream Caesarstone benchtop for your kitchen or bathroom. Furthermore, we offer customised stone solutions for our bathroom or kitchen bench tops to allow for fewer joints, and a luxurious, yet practical and clean, minimalistic living space. This means whatever the dimensions or style of your space, Cutting Edge Stone can tailor a solution for you using our craftsmanship and expertise. Our Melbourne showroom has more than just Caesarstone and will simply blow you away. Our wide selection of natural stone, marble, granite and a host of other materials might be all you need to spruce up your kitchen, bathroom, or any other area in your home or office. If you are concerned about the price of a Caesarstone benchtop, you can rest assured Cutting Edge Stone will provide the most cost-effective solution. We are determined to enhance your home or office by utilising only the best stone products such as Caesarstone benchtops for your kitchen, dining room, bathroom or commercial space. Be assured that our team are always ready to offer you timely advice in terms of which stone products would best suit your needs. 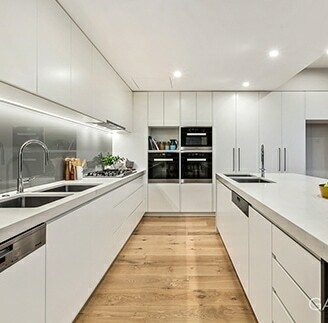 For more information on our selection of top quality natural and Caesarstone bench tops, we encourage you to visit our Tullamarine showroom, featuring Caesarstone products.